Pregnancy can be an overwhelming time for a woman. We are bombarded with information on what we can and cannot do. This is especially true when it comes to what to eat during pregnancy. But one thing all soon-to-be-mamas can appreciate is a quick, easy, safe and nutritious meal to go. Say hello to smoothies! Smoothies are great for pregnancy because they can be adapted to meet increased nutrient and fluid needs, combat unwanted symptoms, and cure a sweet tooth - all in one little cup! Not just any smoothie is going to be the perfect prenatal pick me up. 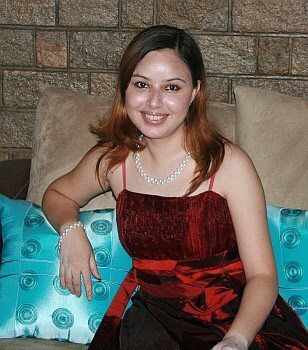 Special: Do you want to have your DREAM BIRTH and make it Memorable Forever? We've got recommendations from followers on this awesome guide - "From Bump To Birth". It shows you how you can use Holistic Therapies like improved diet, herbs, aromatherapy, homeopathy and acupressure for common pregnancy ailments and birth, to have a wonderful, memorable pregnancy and birth! There are certain nutrients and ingredients to be on the lookout for when searching out smoothie recipes during pregnancy. I’m sure you’ve heard all about this one. The B-Vitamin, folate, and its synthetic form - folic acid, are needed to prevent neural tube defects in baby (aka problems with baby’s brain and spine). Iron needs increase during pregnancy. Many women do not adjust their intake accordingly and can become anemic. Iron deficiency anemia is actually quite common during pregnancy and can cause weakness and fatigue. To prevent iron deficiency, be sure to also consume plenty of vitamin C which helps the iron to be absorbed. Electrolytes are substances required for numerous body functions including muscle contractions and maintaining fluid balance. They include calcium, magnesium, sodium and potassium. Mamas-to-be are at an increased risk for dehydration and thus maintaining electrolyte balance in the body is super important! This vitamin has been making headlines over the past few years - and for good reason! Vitamin D helps with bone formation and cell division - two very important things in pregnancy! And - you probably aren’t getting enough from your prenatal vitamin and foods alone. Most prenatal vitamins have only 400 IUs of vitamin D and the American Pregnancy Association states that new studies are recommending supplementing 4000 IUs per day! Definitely something to bring up with your healthcare provider at your next visit. Protein is made of amino acids which are the building blocks of the human body. And during pregnancy, when you are literally building a human body, what could be more important?! Unlike the previous nutrients mentioned (which are micronutrients and needed in small amounts), protein is a macronutrient and is needed in larger amounts - around 70 grams per day according to the Mayo Clinic (more or less depending on your size and specific needs). Omega-3 fatty acids are used for the development of your baby’s nervous system as well as their vision and cognition. 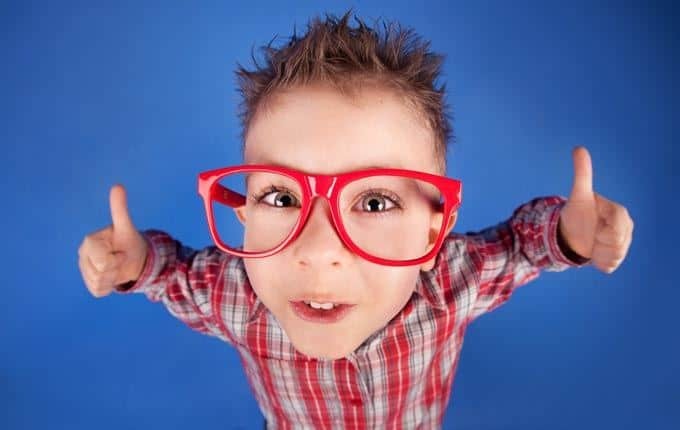 In fact, some studies have found that children born to women who supplemented omega-3 fatty acids during pregnancy had higher cognitive function and hand eye coordination than those who did not. Getting the right amount of fiber during pregnancy can help to relieve a lot of very uncomfortable side effects such as constipation, bloating, and hemorrhoids. It can also help you to feel full longer. Another huge benefit of adequate fiber intake is blood sugar control. Fiber slows down how fast sugars are absorbed and thus reduces spikes. This list touches on just a few of the many nutrients pregnant ladies should take in. If you want to know more about basic nutrition during pregnancy, check out the USDA’s ChooseMyPlate website. But how does all this apply to smoothies?! Well...the smoothie friendly ingredients below can be used to meet your nutrient needs during pregnancy! The USDA recommends 1 ½ - 2 cups of these each day and if you’re taste buds are anything like mine were during pregnancy, that amount may be a struggle! I had a serious aversion to basically anything green (except green Laffy Taffy, maybe?). Smoothies were my saving grace. You can easily sneak a cup of broccoli or green leafy veggies into a smoothie with hardly any change to the texture or taste (although the color will likely give it away!). You can use romaine, spinach, kale, or any other green in fresh or frozen form. A few of the nutrients in these green superfoods include iron, folate, and vitamins A, C, E, and K.
Nuts and seeds are excellent additions to smoothies. They are loaded with omega-3 fatty acids, vitamins, minerals, protein and lots of fiber. Nuts are great additions to smoothies and can be added in their whole form, nut butters, or even powdered. Powdered peanut butter is a great addition to smoothies because it is lower in fat (and cheaper!) than regular peanut butter. As for seeds, my favorites are flax, chia, and sunflower seeds. I always grind my flax and soak my chia seeds overnight before adding them to smoothies. Alright, not everyone is going to agree with me on this one. And that’s okay! There are lots of non-dairy yogurts and milks that are equally as delicious and fortified with lots of prego-healthy nutrients. As with any processed food, just keep an eye on what else has been added to them (sugar? carrageenan?). Personally, I like to switch it up and consume both non-dairy and dairy milks and yogurts. Anyway, back to the dairy. Dairy is loaded with protein, calcium, potassium, and the illusive vitamin D! Organic is key here. Buying organic will guarantee that the cow’s who provided the milk you are drinking were not treated with growth hormones and antibiotics and were fed organic, non-GMO food. Ginger is the anti-ingredient: anti-nausea, antinflammatory, and antioxidant - all of which are GREAT for pregnancy! Ginger may even reduce your risk for heart disease and diabetes! Read more about the “Amazing and Mighty Ginger” here. When using ginger in smoothies, you can use in it’s whole root form, powdered, or as a tea. 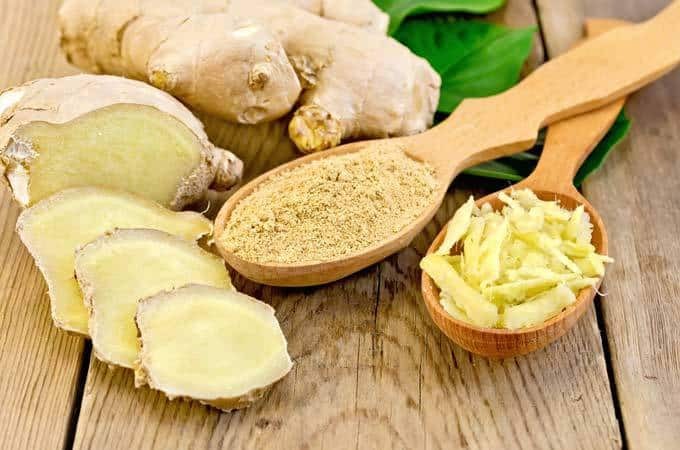 You can get ginger root at most grocery stores. I recommend using a cheese grater to shred it a bit before adding it a smoothie. Yes. It may seem weird but legumes do wonders for the texture of a smoothie. And, they are packed with fiber, protein, iron, zinc, folate, and potassium! I’ve used chickpeas, black beans, kidney beans and (my favorite) tofu in smoothies with excellent results. You can use dry (soak them first! ), canned, or frozen. Next are five ingredients you should NOT use in your smoothies while pregnant. Let’s be real, you should ALWAYS wash produce before using it but sometimes we’re in a hurry and maybe aren’t super thorough or (heaven forbid!) we just grab a handful of those refrigerated berries and throw them in straight out of the container. Pregnancy is NOT the time to do this. Produce can contain listeria which can cause serious illness, miscarriage, or even death of the baby after she is born. But taking a few precautions such as thoroughly washing produce before using (and washing your hands before handling foods) decreases your risk of contracting this bacteria. Unpasteurized dairy products and juices can also be contaminated with listeria. They can also contain salmonella or e. Coli. The pasteurization process kills these bacteria with heat. So, how do you know if a product is pasteurized? Just read the label. If you’re buying the milk directly from a dairy or juice by the glass the product may not be pasteurized and there may not be a label. Check with the person who sold it to you to find out for sure. Have you ever looked at a protein powder, multivitamin, or other supplement and seen on the label that it contains 1000% DV? More vitamins and minerals aren’t always better, especially during pregnancy. Certain nutrients, like copper, iron, and vitamin A can be toxic when consumed in excess. Other supplements to be mindful of are weight loss and detox products (now is not the time ladies!). 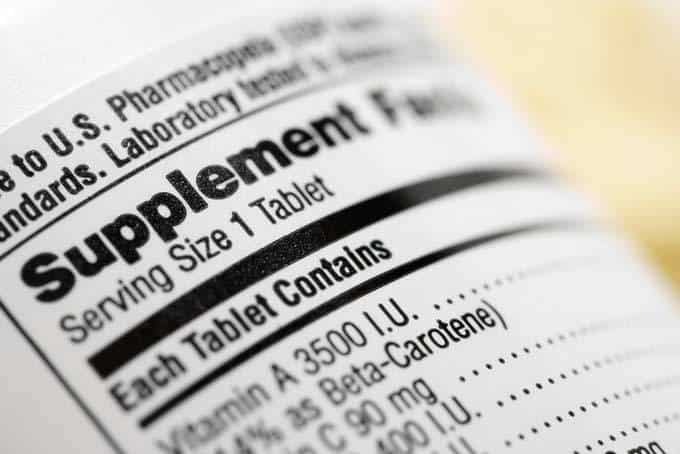 Always check with your health care practitioner before consuming a supplement during pregnancy. Most of us know excess caffeine during pregnancy is a no-no but the exact recommendations on how much you can have varies depending on who you ask. Personally, I went with the American Pregnancy Association’s recommendation of about 12 oz per day (so one coffee based smoothie would have probably been just fine…). So be sure not to go overboard using green tea, coffee or lots of chocolate in your smoothies. It’s always a good idea to limit foods with added sugars because they are often high calorie. And consuming too many calories can lead to gaining too much weight which puts you and your baby at risk. Even if you aren’t gaining too much weight, added sugars should still be avoided because they increase risk of hypertension and chronic heart disease. If you do have a sweet tooth, try to satisfy it with a sweet food that actually has some nutrients in it.. Like a fruit smoothie! So, now that I’ve become just another person telling you to “eat this” and “don’t do that” during pregnancy (please forgive me!)... Let’s get to the fun part. 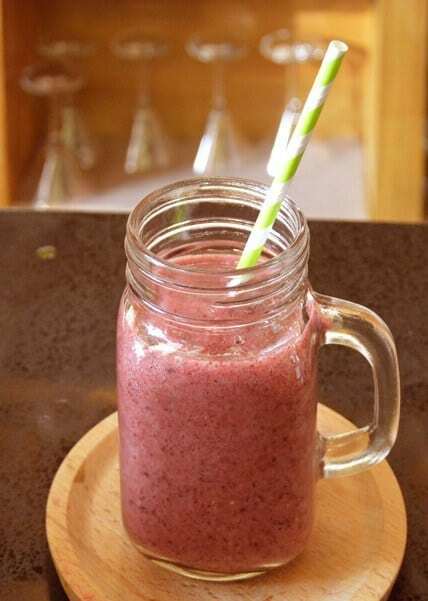 Healthy nutritious smoothie recipes! These recipes take into consideration all of the points we just discussed. You can make them in just a few minutes, anytime you need to cure a sweet tooth, combat morning sickness, aid digestion or as a delicious pick me up. Feel free to share them with family and friends. A friend of mine has even served some of these recipes at a gender reveal party! 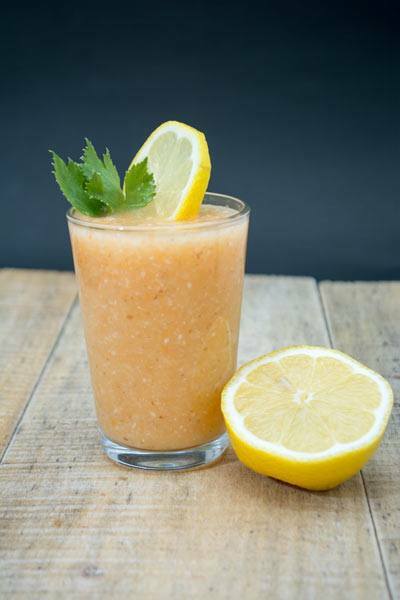 This smoothie will be your BFF when morning sickness is at its worst. 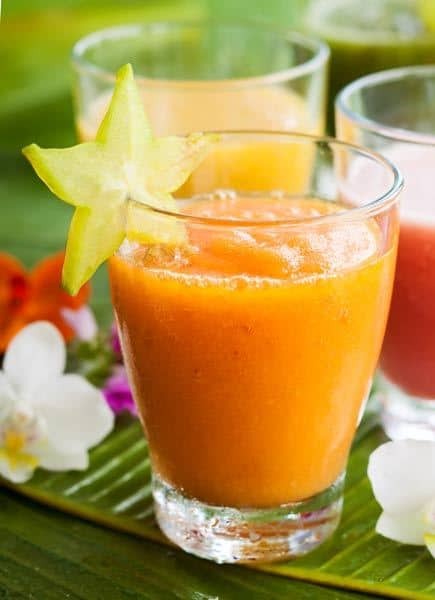 The combination of sweet and sour in combination with the ginger combines for a flavorful, anti-nausea smoothie to consume at any time of day! Combine apples, water (or apple juice), and lemon juice in blender and blend on high until apple is pulverized. Continue to blend. Adjust water to achieve desired consistency. This delicious, creamy smoothie combines the natural laxative effects of prunes with some high fiber bananas for a sure fire way to get things moving. 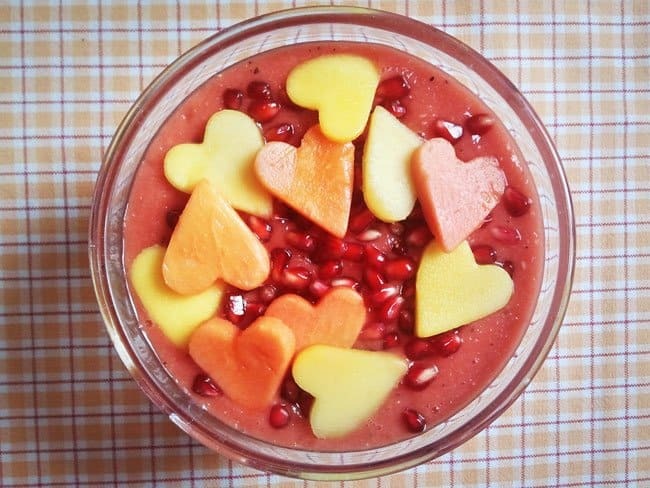 This energy-dense smoothie contains an enlivening blend of flavors and nutrients. It contains natural sugars for a quick pick me up and healthy fats for sustained energy. Savor this smoothy slowly as it is sure to fill you up! Combine ingredients in blender and blend well. Serve chilled and sip slowly! This flavorful smoothie combines iron rich foods with vitamin c rich foods to maximize iron absorption. I recommend using an orange juice that is NOT fortified with calcium. Although a controversial theory, it is thought that calcium may inhibit iron absorption and thus calcium rich foods should not be consumed at the same time as iron rich foods. 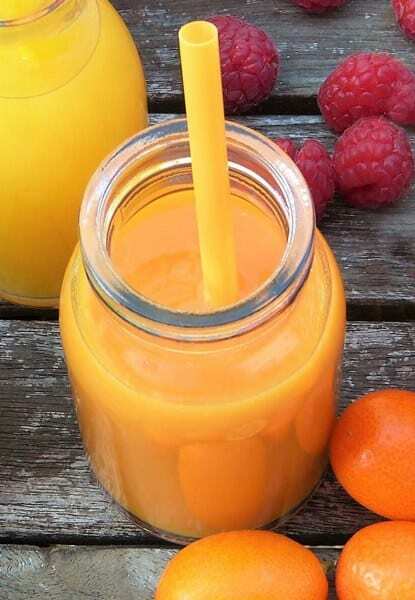 Blend well, pour into a glass, and enjoy! This smoothie uses a unique high protein, high fiber ingredient that you don’t see in many smoothies: beans! Garbanzo beans also contribute to the texture of this thick and creamy smoothie. Tropical fruits and kiwi provides a combination of sweet and tart flavors that stimulate the taste buds. Grind slivered almonds and flaxseed in coffee grinder. Then, combine all ingredients in a blender. It’s hard to believe something so tasty could be so good for you! 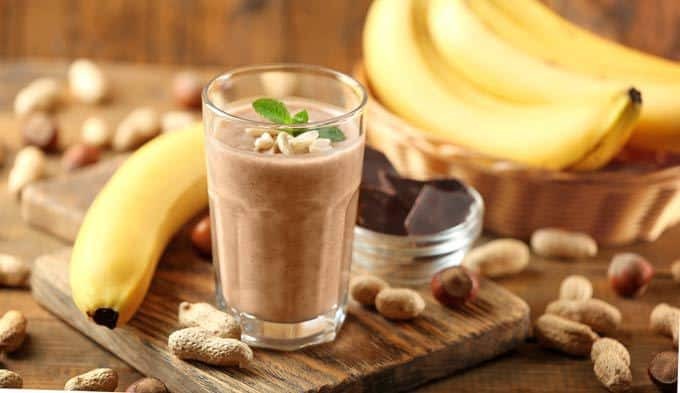 This smoothie is certain to satisfy your chocolate craving as well as your need for protein. To boost protein content even further, you can add chocolate protein powder. Add additional soy milk if you would like the shake thinner. Getting enough omega-3 fatty acids can be hard. Using nuts and seeds in your smoothie can help to boost your intake! 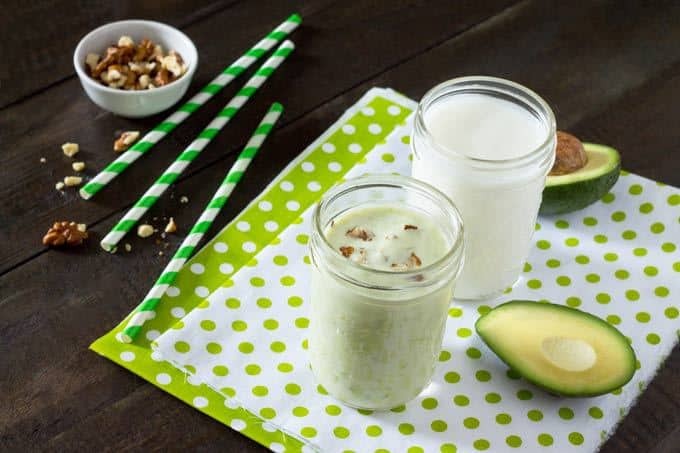 Throw in some avocado for healthy monounsaturated fats and you have a smooth, green smoothie that will provide sustained energy for you and your babe. Pour into a large glass and enjoy well chilled. 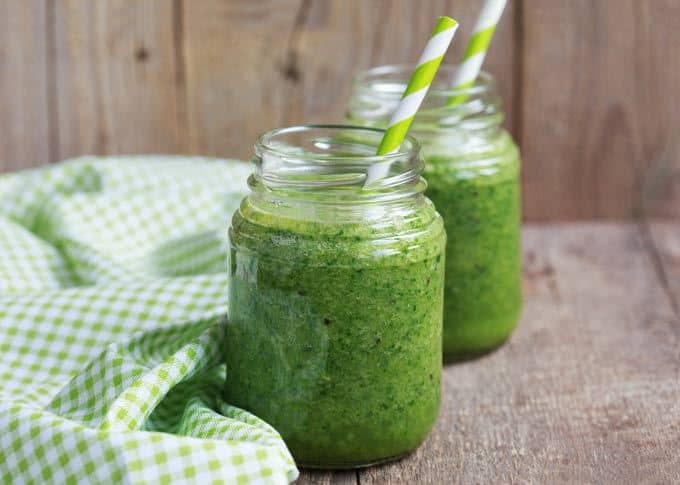 Here we have a green smoothie that is equally delicious and nutritious. 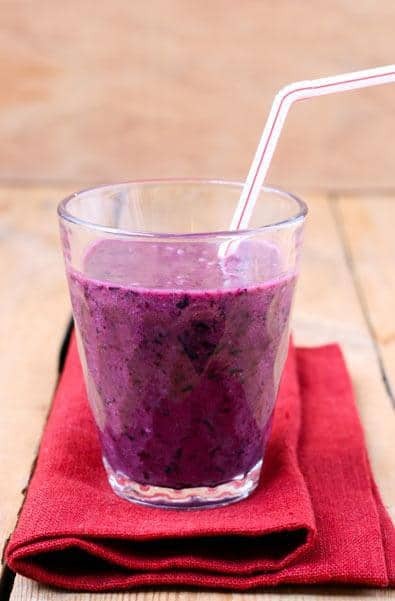 Another great thing about this smoothie is that it can be tweaked according to what you have on hand. 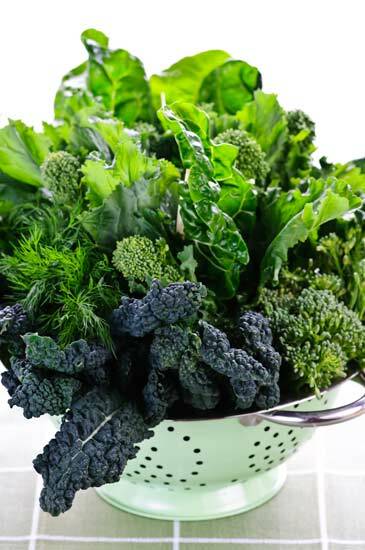 You can use romaine, spinach, chard, kale or any other green you have on hand in fresh or frozen form. This non-alcoholic margarita flavored smoothie is great to consume when entertaining or on a hot summer day. Combine coconut milk and water, grapefruit, lime and kale in a smoothie. Blend until kale is completely broken down. Finish by adding remaining ingredients and blending on high. This smoothie is possibly the best breakfast pregnancy smoothie out there. 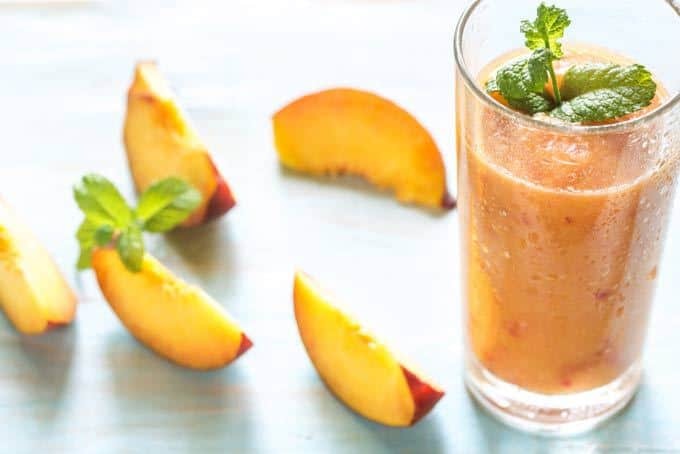 The Fuzzy Prenatal (adapted from the classic fuzzy navel cocktail) combines the classic orange and peach flavors with creamy banana and yogurt for a rich and nutritious combo. The spinach and flax take boost the healthy factor even further adding a plethora of vitamins, minerals, and omega-3 fatty acids. 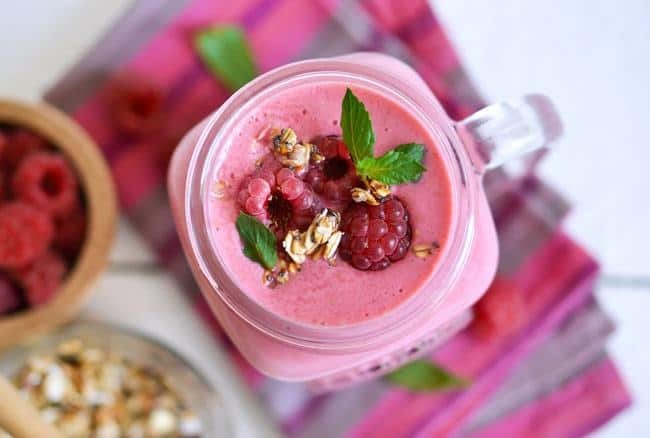 Tip: You can cut down on the sugar content of smoothies by diluting the juices with water and using unsweetened greek yogurt and vanilla extract in place of vanilla greek yogurt. Drinking healthy smoothies can take some of the drama out of your diet. They can be an easy, quick, healthy and delicious meal you can consume prior to, during, and after pregnancy. I’ve prepared this guide so you’ll be able to tell easily which ingredients you should go for and which to avoid at the different stages. I also hope you’ll find your favorite smoothie recipes among the ones I posted here. Feel free to experiment with any ingredient that you’d like, as long as it’s one of the good ones! Did you drink smoothies while pregnant? If so what were your favorite recipes? I would love to hear your stories and tips for blending while pregnant below! 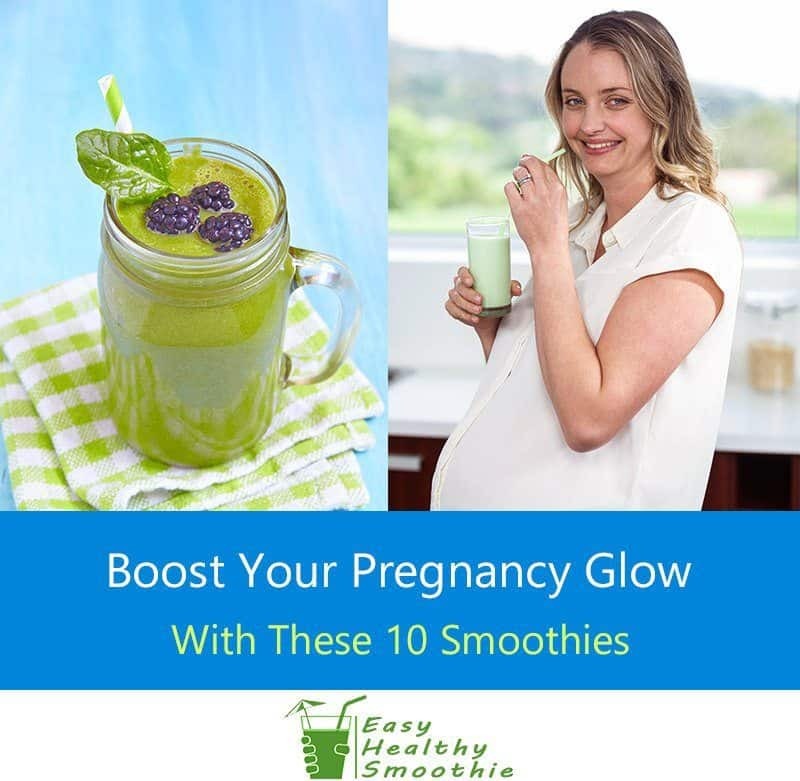 How to make delicious prenatal smoothies that increase energy and combat unwanted symptoms - includes 10 yummy, nutrient-dense recipes! Well it’s been a few weeks now and I’m happy to say that I am indeed blooming quite a bit more than I was before. People are commenting on my pregnancy glow now so I’m going to credit you guys for that! That’s awesome Stacey! Thanks for checking back in and updating us 🙂 Hope your pregnancy is going well in general! My friend is in the early stages of pregnancy and I’m sure she’d get a lot out of these recipes. I’m going to pass some of these recipes onto her. Thanks! Thanks! I saw my friend a few days ago and she’s definitely looking very healthy 🙂 Not sure which recipes she’s tried but she said she’s tried a couple out so far and asked me to say thanks for this piece!